Hey, Guys, "cupcake-mountain?" Really? I mean, it's supposed to be the ocean, so wouldn't "waterfall" or something be better? Not that sharks could very well dismember people in a waterfall, of course. UPDATE: It's true: this was not a pro-made cake. I made the exception because so many of you sent it in, and I thought it was funny. Not poorly-made, mind you; just funny! I think I like that there are only feet and hands strewn about on the cupcakes. 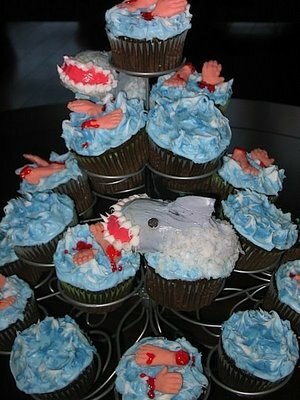 Apparently sharks find them too bony and not meaty enough, so they reckless disgard them all over the cupcake mountain. Also, the sharks teeth are pointed at quite the unusual angles... maybe making feet and hands difficult to chew. I hope I get a dismembered foot on my cupcake... YUMMY! I laughed so hard I almost choked. My dh gets such a kick out of the land shark thing even ou 3yr old does it. You've got a point... and for the record, that's a really messed-up looking shark. Now, maybe I'm just being too literal (I get accused of that at work often), but IF these people were attacked by the shark, wouldn't the shark have EATEN the feet and hands first rather than leaving just that? I mean, how much effort would it take the shark to eat everything EXCEPT the hands and feet? Oh, and the teeth are strange. Like outside his mouth. Quint: When he comes at ya, doesn't seem to be living... until he bites ya, and those black eyes roll over white and then... ah then you hear that terrible high-pitched screamin'. Interesting, Jen. I posted on my Blasts From the Past Blog about "JAWS" just recently. P.S. Love the SNL reference. Looks like these sharks don't eat hands. Surely this was made by a home baker. Not a professional bakery...really? And please, tell me it was not meant for children. I just can't see how blood and body parts should ever come up when decorating a baked good. "I don't need a plumber. You're that clever shark, aren't you?" Thank you for posting this and reminding me of the genius that is Landshark. I'm only a dolphin, ma'am. I think this is the first time a cake on your blog has truly left me speechless. And...disturbed. Not by the dismembered body parts or anything...I'm a horror movie fan so I'm pretty de-sensitized to that stuff. There's just something about this cake that's like having my mental processes run full speed into a brick wall and I'm not sure what it is. ugh. That is one UGLY pile of blue badness. Ewwww, someone has a sick sense of humor! I am going to have nightmares about that shark's mouth. LOVE the bloody hands. Classy. oh dear. there is blood on that "cake". aack! Why don't the sharks eat the hands and feet? Too bony? What do you suppose the occasion was? Meeting of the American Bar Association? San Jose Sharks party? Jets vs Sharks rumble? Those "teeth" make the shark look more like a baleen whale, actually... Beware to phytoplankton and zooplankton alike!! Eeeewwwwwuuu. Canabalism. Just in time for Halloween. Just in time for Halloween! Or, a Medical Examiner's birthday party? Or..
Hey, I saw this on the side bar. Diaper cakes? Eww. ahahaha LOVE the old school SNL reference! Love the severed feet!! This is an awesome site! Ew! Are bloody stumps really necessary??? I had to giggle. Apparently that is one picky shark who refuses to eat the hands and feet of it's victims. Must not be enough meat to be worth his time..... Not to mention, why hasn't someone closed that beach to swimmers? Just this cupcake mountain alone shows at least 5 carnaged bodies. My only question would be, where are the rest of the severed bodies? Do these sharks just have a very discerning palate or do they eat the bodies and save the severed hands and feet to show bloody proof of their conquest? LOL!!!! This was a GREAT way to start my day...thanks for all the wrecks, and I love the SNL reference! The severed feet and hands are very tasteful. I'm sure Chevy and John would approve! Not enough people reference the Land Shark skit, IMO. I rather liked this one because it's plain silly. Gore and cake, always a good idea. Wow... Can you imagine getting the cupcakes with the displaced, bloody hands. I will never eat a cupcake again. So is this better or worse than a cupcake cake? Inquiring minds want to know! Yeah, not a fan of the bloody stumps! Did they make the dismembered body parts? Or are they available for sale? Hey, I've seen those wire cupcake trees for sale. I thought they were cool. However... the Jaws cupcake tree is quite wrecktastic. The more I looked at this, the funnier it got! Wreckier too. ROFLMAO LOVE the SNL reference! I suppose I'm not the first commenter today to admit that I just like this cupcake mountain and have no good reason -- well, part of my reason is that it's aiming for goofy and hitting the mark. Almost meta-what-Cake-Wrecks-doesn't-like-about-cupcake-cakes. And the way it's arranged kind of brings to to mind what must be the disarray and confusion of a feeding frenzy . . . okay, I'll stop now. Ok Timmy, you get the big shark because you've been good. And you Dana? You get a bloody leg. Yes well, that's what happens when you draw on the walls. There are consequences! Screaming with laughter. I remember Candy Gram! My brother used to come and knock on my door and say, "Candy Gram." LOL! Thank you, Jen, for putting a smile on my face this morning. Even Chevy Chase would shudder! Apparently sharks don't find hands and feet appetizing? Also, hands and feet are extremely buoyant.. What??? Why??? Seriously, do we know why this cake was commissioned? Tell me it's not a wedding cake.